Preauricular sinuses and preauricular epidermal inclusion cysts are common and known for recurrence. The reason for recurrence is incomplete excision due to inadequate exposure. 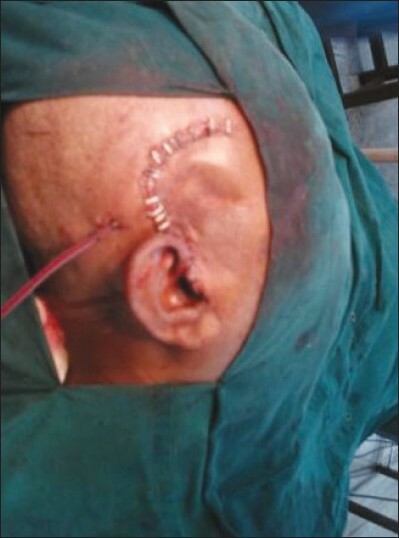 We report a patient in whom a preauricular epidermal inclusion cyst was operated four times in six years with recurrence every time before he presented to us. We used a temporal flap approach for excision with advantages being complete unhindered exposure, excellent cosmesis and prevention of damage to temporal branch of the facial nerve. A 40-year-old male patient presented with history of swelling in front of the right ear for the past 6 years. He had undergone surgery four times before with recurrence of the swelling every time before presenting to us. Examination revealed a 4 cm × 4 cm fluctuant swelling in the right preauricular area with scars of previous surgeries. The anatomy of the preauricular area is significant for the presence of two important structures that cross the zygomatic arch in this region-one is the superficial temporal vessels and the other is the temporal branch of the facial nerve which supplies the orbicularis oculi. Whereas injury to the superficial temporal vessels is more of a nuisance, injury to temporal branch of facial nerve can have important consequences for eye closure as it supplies orbicularis oculi in addition to the frontalis. The temporal fad pad has two parts-superficial and deep-divided by temporalis fascia. 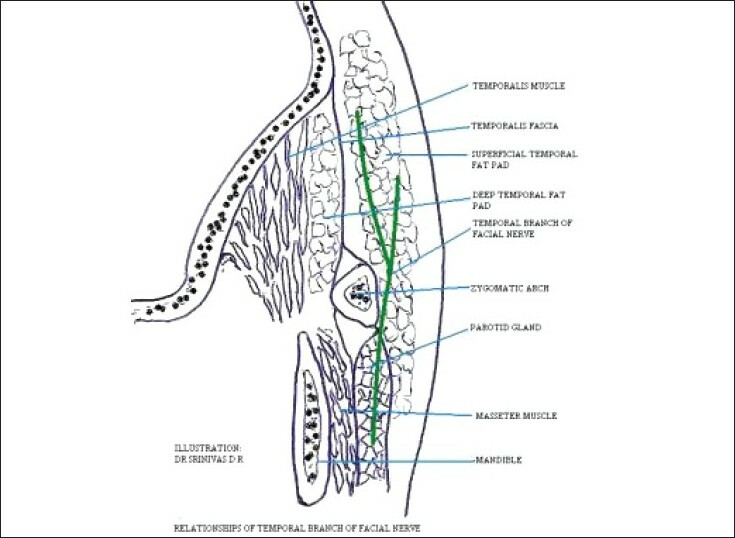 After emerging from the parotid gland, the temporal branch of facial nerve crosses the zygomatic arch at least 10 mm in front of the tragus and runs in the superficial temporal fat pad, superficial to temporalis fascia [Figure 1]. Injury to the nerve can be prevented by raising a flap in the plane of the temporalis fascia, thus avoiding having to work through the superficial fat pad while approaching the cyst. On reaching the superior limits of the cyst, injury to the nerve can be prevented by keeping the dissection close to the cyst while the flap is elevated completely. A preauricular incision was taken as it is cosmetically inconspicuous being located at the junction of two facial cosmetic units. The incision was extended into the temporal area in a reverse question mark pattern [Figure 2]. The flap was elevated in the plane of the temporalis fascia. On reaching the upper limit of the cyst, dissection was kept close to the cyst while the flap was completely raised to give all round exposure of the cyst. On removal of the cyst, a deep excavation defect remained which would lead to an ugly depression in front of the pinna. We therefore, raised the posterior part of the temporalis muscle from its cranial attachment as an inferiorly based flap and turned it into the defect. The wound was closed over a suction drain [Figure 3]. The postoperative cosmetic appearance was excellent and orbicularis oculi and frontalis muscle function was normal. 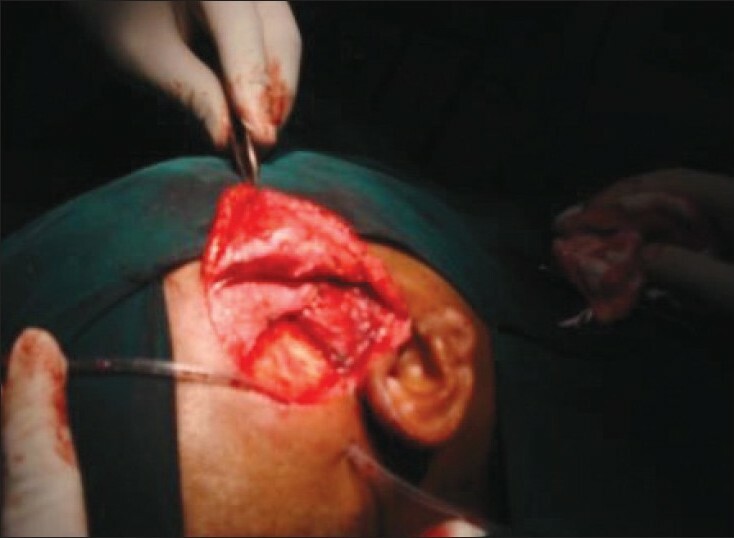 In view of the difficulties encountered in exposure and recurrence in case of incomplete excision, we found that the above method is very suitable for all large and recurrent preauricular sinuses and epidermal inclusion cysts. The above method is cosmetically excellent, gives excellent exposure and prevents injury to facial nerve branches supplying orbicularis oculi and frontalis. 1. Susan Stranding: Gray's Anatomy. 39 th ed. p. 513-4.